Access the online web pages version of Issue 10 using the menu at right. Each issue takes hundreds of hours of work as we strive to make depth psychology more accessible in the world. The suggested donation is $10 for this issue. 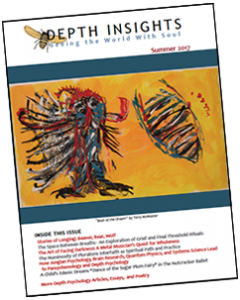 Depth Insights™ is a semi-annual journal that has served as the primary scholarly peer-reviewed depth psychology publication for the online community, Depth Psychology Alliance, since 2011. Huge thanks to the Depth Insights Editorial Board for their contributions to our current issue! The mission of Depth Insights is to make depth psychology more accessible to everyone by publishing well-written, high quality depth-psychology-based articles, essays, poems, and art that best illustrate how depth psychology can enhance the lives of those who engage with information and practices aimed at accessing the unconscious. When we begin to understand the symbols and messages that come through from the unconscious to help orient and guide us in daily life, these insights help us make meaning. 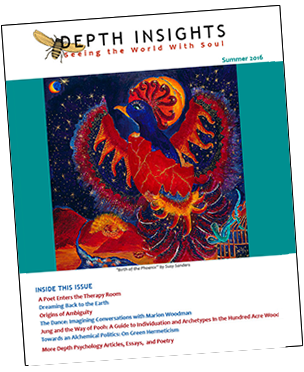 Depth Insights journal appeals to a wide audience, from those who are new to Jungian and depth psychological ideas as well as to those who are seasoned scholars and practitioners in the field. Each issue is provided as a downloadable PDF as well as a set of easy-to-navigate web pages. Please consider a small donation to help us continue to bring you this labor of love. Each dollar helps us offset the cost of evaluating submissions, reviewing and editing articles, creating the layout, and hosting and maintaining the website. Suggested donation: $10 per issue. Depth Insights is NOT currently taking submissions as we are on hiatus. Online web pages version: Use the links at right.